Cadillac: New V8 underpins 2019 CT6 V-Sport model. Cadillac CT6 V-Sport 4.2L Twin Turbo V-8. Cadillac made some news this week when it announced the forthcoming 2019 CT6 V-Sport model, a performance variant of its largest sedan. But it wasn’t simply a new trim that caught everyone’s attention, rather an all-new engine, one exclusive to GM’s luxury marque that will power the V-Sport. The engine is a 4.2-liter twin turbo V8, a long-promised and often-rumored powerplant for this luxury emblem. GM estimates the engine will deliver 550 horsepower and 627 pound-feet of torque, numbers that will challenge BMW M and Mercedes-AMG for supremacy. Cadillac will offer a slightly detuned variant too, delivering a more “modest” 500 horsepower. The new engine will be hand-built at GM’s Performance Build Center in Bowling Green, Kentucky. That same plant also builds the Corvette Z06 engine. It is no secret that Cadillac Racing is a formidable force and because of that its engineering has trickled down to Cadillac V-Series and V-Sport models. The automaker says the new engine is a “clean sheet design,” which means it isn’t the derivative of an existing engine. The brand claims unique design elements in an effort to weigh performance with efficiency. Importantly, the fresh build allows the automaker to achieve the performance goals it had in mind for the CT6 V-Sport. 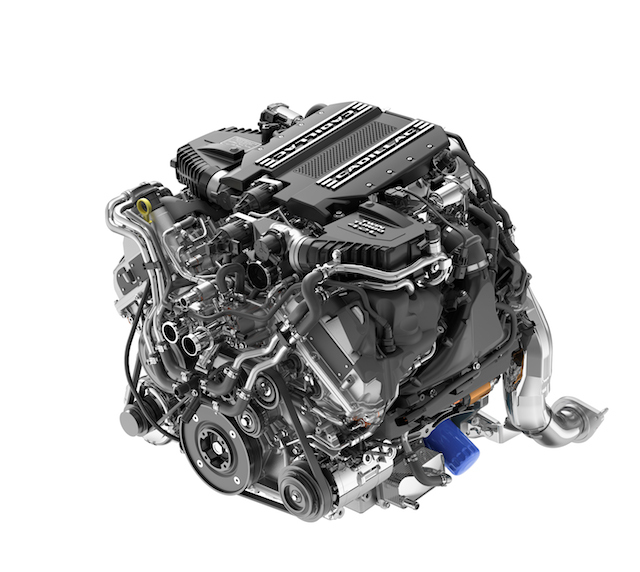 “It builds on Cadillac’s well-established turbocharging know-how and forges new ground with innovative features that deliver exceptional performance and refinement,” explained Jordan Lee, 4.2L TT V-8 chief engineer. The all-new 2019 Cadillac CT6 V-Sport. Cadillac says the center of the engine’s design is a “hot V” configuration, one that switches the traditional order of the cylinder heads’ intake and exhaust systems. This arrangement allowed the engineers to place the turbochargers at the top of the engine or in the valley between the heads. The manufacturer claims the layout essentially eliminates turbo lag, while keeping the engine’s overall footprint tight. The new design enables intake-charged air to enter by means of the lower outside of the heads before exiting through the top inside, where the turbochargers sit within the exhaust manifolds. A quick spool up renders an almost immediate power transfer. Further, the design permits closer mounting of the catalytic converters, yet another contributor to this engine’s smart packaging. Besides the new engine, the Cadillac CT6 V-Sport will benefit from a new 10-speed automatic transmission. This transmission is prized for it wide gear ratio, which Cadillac claims enhances step-off acceleration. With smaller steps between gears, the transmission aids the engine in maintaining optimum power nearly at all times. As for the new model, the automaker says that its design inspiration comes from the Escala, a handsome concept car introduced at the 2016 Pebble Beach Concours d’Elegance in California. This translates into a bold, dark front with a large V-inspired mesh grille along with new horizontal LED headlamps and vertical accents. Also adding to the menacing look are lower aero components and gloss black side window surround trim. The sedan will ride on unique, 20-inch V-Sport wheels set within summer tires developed exclusively for Cadillac. Other features include a mechanical limited-slip rear differential for improved traction and predictable performance while on the track or when carving corners. A V-Sport specific suspension, a 19-inch Brembo brake system, modified steering and magnetic ride control damper calibrations, and a new exhaust system are among the other performance highlights for this model. Besides the V-Sport, the 2019 CT6 lineup introduces Cadillac’s “Y” trim strategy for each of its models. Specifically, each model will have Luxury and Sport trims with varying personas and characteristics. For instance, on non-V-Sport CT6 models, new horizontal high-lumen headlights and a revised taillight design rejuvenate the brand’s trademark lighting, drawing inspiration from the Escala Concept. 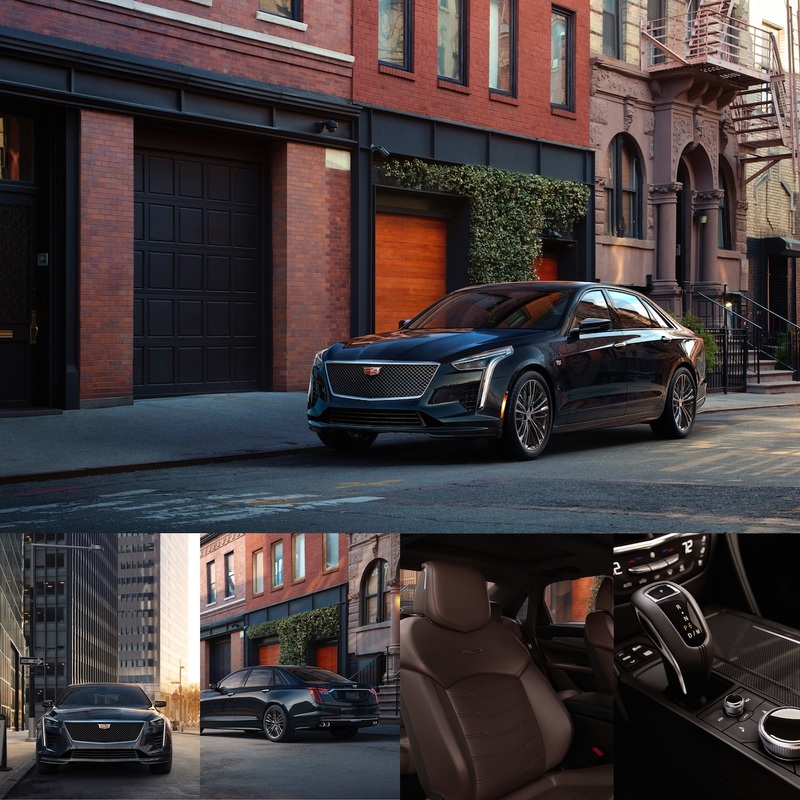 More information about the V-Sport and other Cadillac models will be offered at the 2018 New York International Auto Show, which opens to the public on March 30 at the Jacob Javits Convention Center in Manhattan. Please bookmark this page as we’ll supply updated and new information as it occurs.